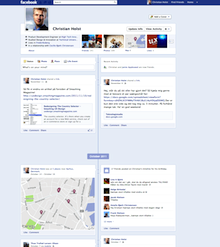 The new Facebook timeline is a dramatic departure from the current profile view. There’s many things to like about it: good use of metaphor, a sense of space, and a simple navigation model – all of it presented in an aesthetically pleasing package. This article aims to highlight some of the thoughts and observations we made on first look. The new Facebook Timeline design. The metaphor works really well. A line cutting down the middle of the screen, with all the events from your life tied to it in chronological order, from the day you were born up to the present. A timeline of your life. (Or at least your Facebook presence). Interestingly, this timeline model works exceptionally well digitally – interactive and forever expanding, yet still easy to use. It would be interesting to see a newspaper such as the New York Times organize their homepage the same way, or have a historical event cataloged in a similar style. The timeline features a deceptively simple navigation model: you can go up, or you can go down. Down goes back in time. Up brings you towards the present. This means the space you’re navigating within is very tangible. While the link-based navigation can be helpful, you don’t actually need it – you simply scroll in the direction you want to go. Unlike a typical online navigation model, you don’t click a link to get to a page, then click another link to get to yet another page, and then click a third link to get back to the first page again (or was that actually the second page you just returned to? Or a completely new one?). No, on the timeline you just scroll. A dynamically expanding and collapsing “calendar” navigation (showing all years and the 12 months of the year you’re currently looking at), combined with a header displaying year and month, gives you a good idea of where you’re currently at (#2). The flood of timestamps – one on each event – doesn’t hurt either. The simple navigation model of just scrolling down to go back in time and scrolling up to go forward in time, means you always know where you’re coming from (#1) and where to go (#3). This is an excellent example of how to create an illusion of space in the online realm. Even though everything is very blue (seriously, the background is one shade of blue, header and links another, timeline a third) this new design looks and works great. Certain events are only displayed as a dot until you hover and a dialog opens with the actual content. Simple timeline events (e.g. a “Like” with no comments) are collapsed to make the timeline less cluttered. Visual posts (photos, maps, etc.) on the other hand are typically expanded, making the overall timeline seem more interesting and alluring as there’s a good ratio between visuals and text. Massive amounts of user-generated content, all presented in a neat and intuitive package. Elegant. It’s a little scary just how much Facebook knows about you. We always knew this, but in the old design things quickly disappeared from your Wall. “Out of sight, out of mind” right? Well, it’s not out of sight anymore. The new timeline design makes it painfully clear just how much personal data Facebook stores about you. It’s a very powerful visualization which could make some people even more considerate of how much (or little) they share going forward. The new timeline design is really interesting. From a UX perspective it’s deceptively simple. Many things to like. Some to dislike. Authored by Jamie Appleseed. Published on November 16, 2011. The DESIGN from a UX point of view I agree looks interesting and simple can’t wait to click everything, but you are right it’s scary how much FB knows about us, I one stopped sharing everything…. From another Ux Perspective. A lot to add and a lot to scroll. A normal facebook user with no psychological/personality disorders won’t go that deep back to someone else’s history, unless he is some serious stalker. Or why would a user read something from his own life, when he lived it, making everything a memory ? but – for fb, its all good for the business as long as the facebook, as a corporate entity is getting more organized information regarding their 800 million products aka Users. It’s certainly true that few will actually read through the entire history of another person, but I don’t think it’s unlikely they will scroll far back in history (simply jumping back five years without actually reading anything in between). I guess this means things you posted on Facebook a long time ago is more likely to reappear, which can be both good and bad. I love it. The profile finally feels useful and lets be honest, its cool looking back to the first posts on your wall, back in the day when you had to accept users etc. The two previous posters pretty much said my comments and concerns. Agreed, the profile feels a lot more useful now – even if (as Ben Jacob pointed out above) it’s unlikely people will actually read the entire thing. Still, it’s certainly an interesting approach. I agree that it is nice, and also a little scary. The Timeline has definitely helped me to clean up my private information a bit, and helped me to find content I shared, that I couldn’t otherwise remember or find. I really cannot agree. Interesting though, what you write. I really don’t like the new timeline. Read here why. It’s a good metaphor, but not a good use of a metaphor. There’s no real scale on the time line as far as I can tell. 100px could be 2 months or 3 hours, depending on the users posting. I know that it would be impractical to use the same scale for all users – which is why they shouldn’t even use this metaphor to begin with. 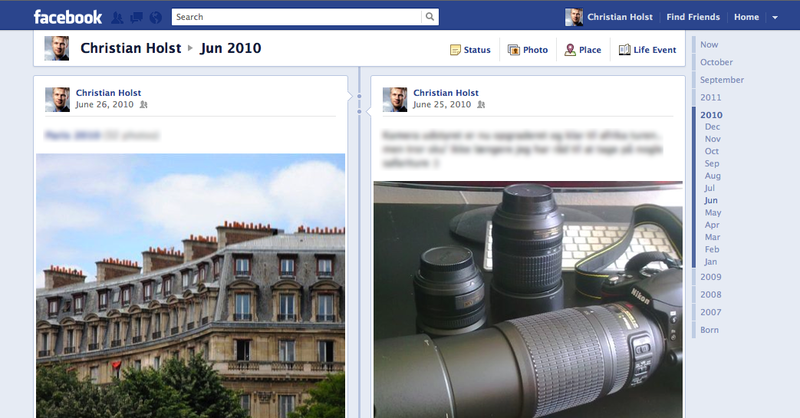 Facebook’s “timeline” is just like the old one, but with two columns. The metaphor doesn’t really add anything.